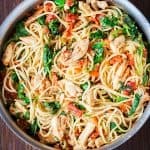 One bite of this Tomato Spinach and Chicken Spaghetti and you will never buy jarred tomato sauce ever again. Spaghetti is tossed in a fresh and flavorful sauce with pieces of juicy chicken. Fresh spinach adds a boost of nutrients, but feel free to use other vegetables to customize to your family’s liking. There are literally thousands of spaghetti combinations that you could think up. Everyone has their tried and true spaghetti noodle, hamburger, red sauce recipe. Heck, you probably don’t even need a recipe for that one. That’s the one that we make over and over again, the go-to spaghetti recipe. 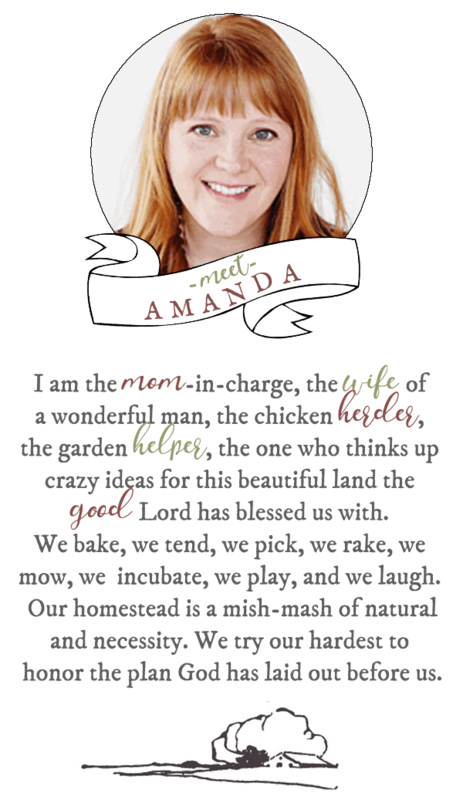 However, if you are anything like me, I just love to mix things up in our kitchen. I get tired of the same things over and over, so I like new takes on classic pieces. This variation does not disappoint! You wouldn’t believe the flavor punch that you get when you add spinach and chicken to this recipe. Fresh veggies are my favorite thing to work with. I try to add them into anything and everything for a few reasons. Number 1, vegetables are good for your body. Number 2, we garden so we have an abundance and sometimes using them up is easier than canning or preserving them for later:) . Trust me, we do that too! When you think of spaghetti you probably don’t envision chicken. Just run with me on this one. It works. 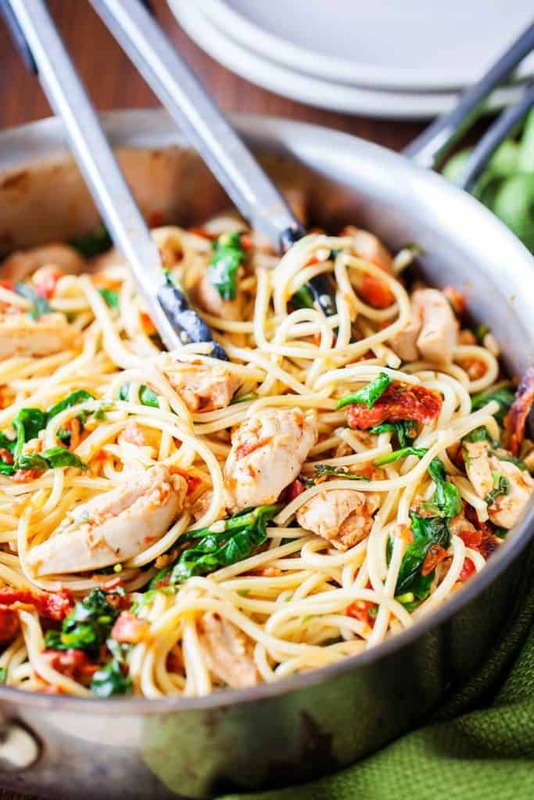 To throw this easy recipe for tomato spinach chicken spaghetti together, you just need to follow a few simple steps! Cook the spaghetti and set it aside. Put the sun-dried tomatoes into a medium bowl and mix in 2 tablespoons of the oil, the red pepper, and the salt. Put this into a skillet and once it begins to sizzle, add the chicken. Add the Roma tomatoes, basil, and garlic and cook this for about 30 more seconds. Reduce the heat and add the spinach. Youll cook that just until it starts to wilt. Add the noodles and toss everything together. Serve and enjoy! Pro tip: Prepare all the ingredients while the spaghetti is cooking. Having the ingredients ready ahead of time streamlines the cooking process and makes whipping up the sauce a breeze. Pair this with some of our favorite (and super easy) no yeast breadsticks. I would boost up the garlic on this recipe. It is such a nice compliment to tomato spinach chicken spaghetti! We also have country garlic cheesy bread if you need a little something more. Also, this recipe calls for boxed spaghetti noodles, but you could always make your own. Here is a recipe for our homemade egg noodles. Just make them a little thinner and you have what you need for a true home cooked meal! 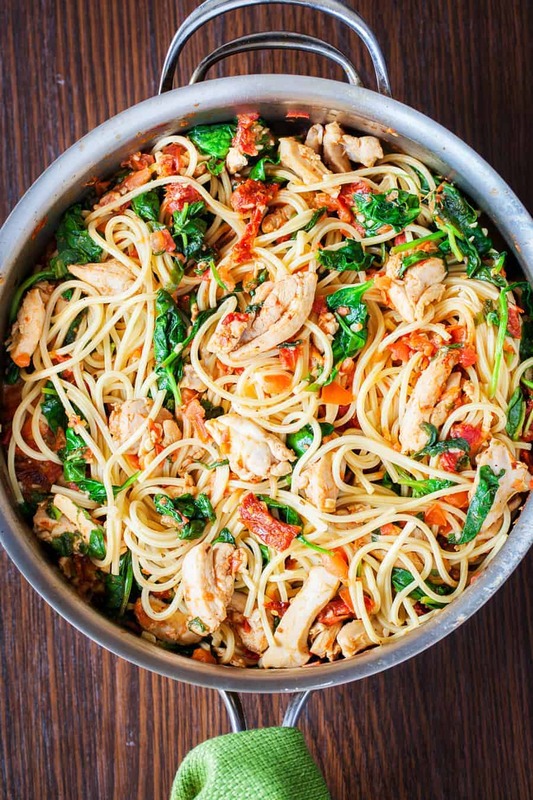 One bite of this Tomato Spinach Chicken Spaghetti and you will never buy jarred tomato sauce ever again. Spaghetti is tossed in a fresh and flavorful sauce with pieces of juicy chicken. Fresh spinach adds a boost of nutrients, but feel free to use other vegetables to customize to your family’s liking. Cook the spaghetti according to package directions. Drain and rinse under warm water. Set aside. Remove the sun-dried tomatoes from oil (reserve the oil) to a medium bowl. Add 2 tablespoons of the reserved oil, followed by the red pepper and salt. To a large skillet over medium-high heat, add the sun-dried tomatoes mixture. Once the mixture begins to sizzle, add the chicken and cook until cooked through. Add the roma tomatoes, basil, and garlic. Cook until fragrant, about 30 seconds. Reduce the heat to medium-low and add the spinach. Cook until spinach has wilted. Add the spaghetti and toss to coat. Continue heating until heated through. Serve immediately. DID YOU MAKE Tomato Spinach Chicken Spaghetti? Recipe Adapted from Julias Album. Photography by The PKP Way. Just made this for dinner tonight. Used whole wheat pasta and left out the basil. Tasted it and it’s really good. I only wish the nutrition info was included. This was delicious and easy to make!! we have a spinach issue in our house. my hubby gets gout flares when he eats spinach. any suggestions on another green/veggie that could substitute for it? broccoli and asparagus are also bad veggies for his gout, so i ruled those out. This was good but we found it rather dry. I added some chicken broth and white wine to juice it up a bit. French bread to soak up the sauce. That was delicious – great mix of flavours, and voted a “keeper” by the whole family! Wish you would add the Nutrition Facts to all recipes. I want to try this one – looks so good and healthy too!! I have some cooked turkey that I’ve cut into chunks – do you think that would work – probably won’t be as “juicy” but maybe it will be a good way to use up some of the turkey?? second time to make this dish, very good and easy! I had to use basil paste because store did not have fresh. I also cooked my chicken in my Instant Pot. Added a little chicken broth when wilting spinach. Family said it was a keeper. Just made this dish tonight after a late trip to the grocery store on a rainy Sunday night. OMG, this is absolutely delicious! I usually double the garlic in recipes but no need to for this! Instead of mincing the garlic, I used my garlic press. Next time, I’ll add more chicken. This is a new favorite. I love this dish! I’m so grateful that one of my friends shared it on Facebook. I cut up everything and start the pasta water when most is cut up, then cook as the pasta is added to boiling water. Everything is done at the same time and it’s all piping hot! Yum! how long do you cook the chicken…i’m always so nervous that its not cooked enough…. Just made this recipe tonight. I loved it…i’ll look forward to making this again in the summer when tomatoes are ripe and basil is fresh from the garden. This was so-o-o-o-o good! Took me way more than 10 minutes to prepare but worth every minute! No one could believe how low cal it is! I added Portabello Mushrooms to make it seem meatier as I didn’t think 8 ounces of chicken was enough for 5 servings. Worked out just right! Thanks!! Made it for the first time tonight. Followed the recipe without any changes. It’s really good! !